Super-Duper Saturday is November 17, 2018. Black Friday is November 23. You're hearing it here first. 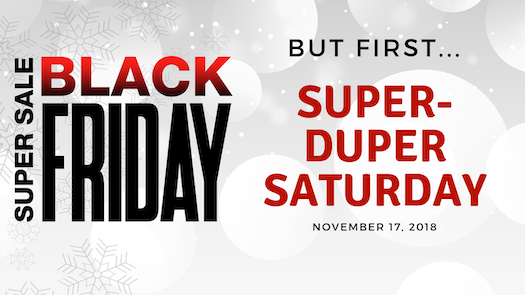 This Saturday, November 17, we're celebrating Super-Duper Saturday. It's our antidote for Black Friday! You'll get our best sale of the year -- TWICE in November! Super-Duper Saturday lets you chase the coolest sales in town on Black Friday or relax with the family, knowing you've already scored all the comics merchandise you wanted. NEW THIS YEAR ON BLACK FRIDAY, we are celebrating locally made unique, hand-made gifts on Black Friday. You'll find one-of-a-kind gifts crafted by Jen Monson (FB), Mandy Wagner (FB), and Chris Cinder (Insta). NEW IN 2018: And be sure to check out Rolly's Graphic Novel Sets with Tote! It's a $90 deal of #1 collected editions for only $40. Select from DC, Marvel, or indie sets. Available while supplies last. Price may vary depending on the collection, but it'll still be a spectacular deal. MEMBERS: Watch your inbox this week for your Power Up Bonus.